Are you looking for a unique holiday decoration that no one else has? Look no further than the elegant, yet simple beautiful gift. This unique decoration has been made from great quality, and would look perfect in any setting!. Nativity/Angel Pyramid. Richard Glaesser pyramid. 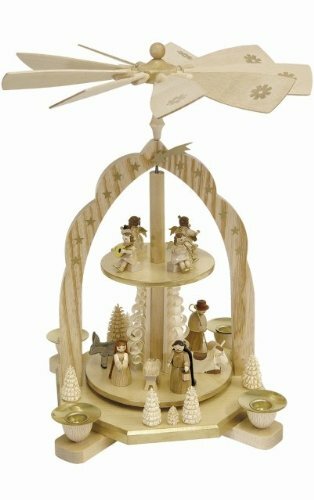 Natural wood color arch design, 2-tiered Nativity scene with three Wisemen and angel musicians. Heat rising from candles (candles not included) turns paddles and base. Made in Germany. Dimensions: 7.25″ x 7.25″ x 12″. Materials: Wood. Natural wood color arch design, 2-tiered Nativity scene with three Wisemen and angel musicians. Heat rising from candles (candles not included) turns paddles and base. Dimensions: 7.25″ x 7.25″ x 12″.